Aeromon successfully conducted pilots at the Ämmässuo waste treatment centre (operated by the Helsinki Region Environmental Services Authority HSY, Finland) in 2015, and in oil and gas industry sites in 2016. The pilots demonstrated the potential to make significant efficiency and financial savings in process industry monitoring applications. In each study, the lightweight, easily deployable nature of the Aeromon platform made it possible to map large areas which would normally prove time consuming solely on foot. When coupled with automated analysis and visual reporting, the whole emissions mapping process gains huge efficiency increases. 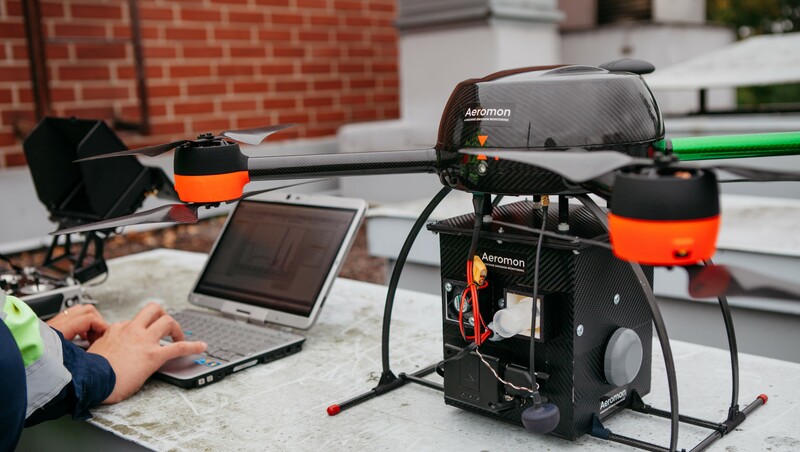 Aeromon wants to help the world understand the true extent of its emissions. Aeromon’s analytics platform and mobile sensors help industry professionals measure and visualize more than 70 different gases. The Aeromon Emission Monitoring System consists of an RPA-mounted BH-8 sensor module with an active sampling system, a data handling/communications computer and a web based analysis platform, the Aeromon Cloud Service. When combined, Aeromon gives its industrial partners the ability to rapidly map on-site emissions in a flexible, accurate manner, delivering significant time savings, real time reporting capabilities and a scalable cloud data storage solution, Aeromon Cloud Storage (ACS).